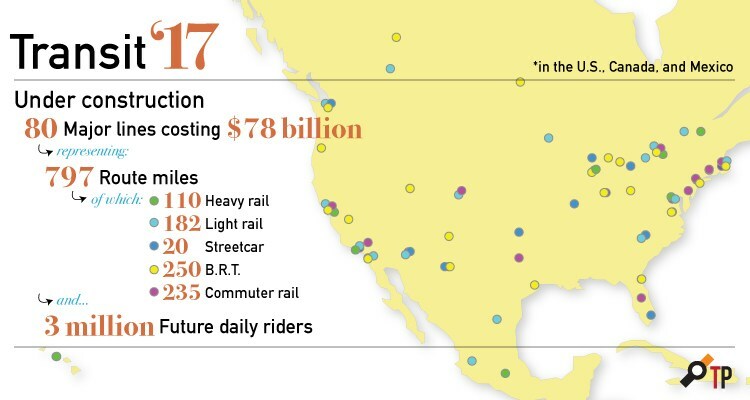 2017 is going to be a big year for transit expansion projects, reports Yonah Freemark in his annual roundup. This year, about 80 major new transitways will be under construction across the U.S., Canada, and Mexico, reports Yonah Freemark in his annual roundup at the Transport Politic. Momentum for transit expansion is especially strong at the local level. In November, voters in several American cities approved transit packages that will significantly expand their bus and rail networks. But the election of Donald Trump and Republicans’ continued control of Congress have also injected some uncertainty. At her Senate confirmation hearing, Trump’s nominee to lead U.S. DOT, Elaine Chao, would not confirm that she would approve federal funding for projects that are already in the pipeline. Despite the concerns about changes in Washington, 2017 will be a big year for new transit expansions. San Francisco’s BART and Toronto’s TTC heavy rail systems will both be extended. New light rail lines will open in Charlotte, Denver, Guadalajara, and Monterrey — as well as new streetcars in Detroit and St. Louis. And new bus rapid transit routes will serve customers in Albuquerque, Fresno, Oakland, San Jose, and the Chicago suburbs. What is unquestionable is that spending on new projects — despite the glitz associated with them (and the attention they get on this site and others) — is not adequate to support increasing transit ridership. More must be done to make transit more appealing, and alternatives less so. While the two major transit projects in Milwaukee won’t be opening to riders this year, they’ll both be taking substantial steps forward. The Milwaukee Streetcar, for which utility relocation work is rattling my very desk, will begin guideway construction in the coming months. Actual rails will be welded together for a project that was approved in early 2015. The first phase of the streetcar, which will connect the Lower East Side, East Town, Historic Third Ward and Milwaukee Intermodal Station, is expected to begin passenger service in late 2018. The second phase, which will connect the existing route with the The Couture and lakefront, is expected to open in 2019. The proposed east-west bus rapid transit (BRT) system that would link Downtown with the city’s west side, Wauwatosa and the Milwaukee Regional Medical Center, is undergoing final engineering work. Teams can be spotted doing surveying and conducting traffic studies on city streets. That system, which has an estimated price tag of $48 million, won’t begin construction this year, but a final decision on a route could come this year. Milwaukee County is applying for a federal Small Starts grant to support its construction. Service could begin operating as early as 2019.